From left: Katrina Welch, Jim Silvestri, John Mann, Colleen Brown, Louis Mestier, Robert Howren, Kathy Castillo, Sandhya Edupuganty, Brian Kaufman, and Jim Kennedy. 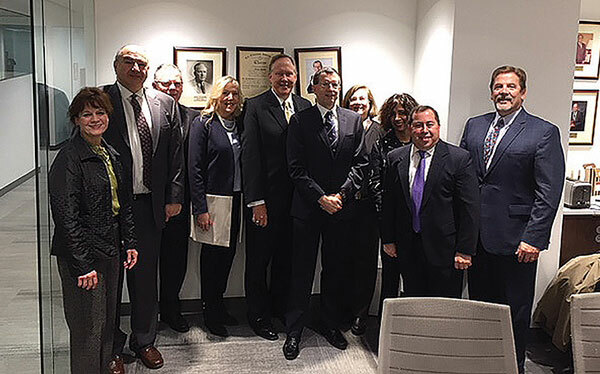 With the portrait of TEI founder Paul Smith in the background, the Institute’s leadership delegation gathered in Washington, D.C., for annual liaison meetings with the Internal Revenue Service and the Treasury Department’s Office of Tax Policy. Attendees included Katrina Welch, TEI secretary; Jim Silvestri, senior vice president; John Mann, chair of the tax reform task force; Colleen Brown, Louis Mestier, and Kathy Castillo, all members of the executive committee; Robert Howren, international president; Sandhya Edupuganty, chair of the federal tax committee; Brian Kaufman, chair of the IRS administrative affairs committee; and Jim Kennedy, treasurer.